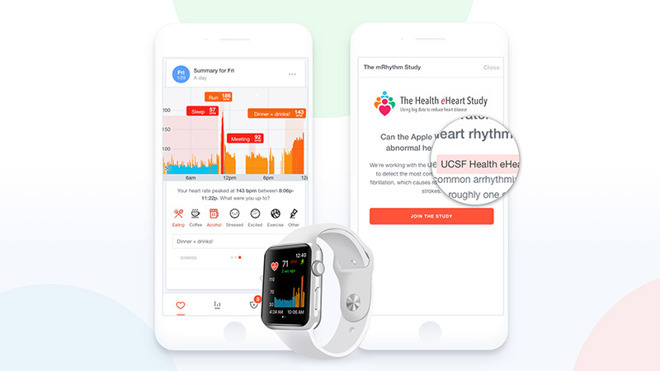 New research conducted by the University of California, San Francisco, in collaboration with Apple Watch app Cardiogram, shows Apple Watch's heart rate sensor can aid in the detection of atrial fibrillation, a common heart arrhythmia that can lead to stroke. As part of ongoing research, a deep neural network was trained and paired with Apple Watch's heart rate sensor to automatically distinguish atrial fibrillation from normal heart rhythm in a pool of test patients. Findings were presented at the Heart Rhythm Society's Heart Rhythm 2017 conference on Thursday. To train the DNN, researchers collected data — 139 million heart rate measurements and 6,338 mobile ECGs — from 6,158 Cardiogram app users enrolled with the UCSF Health eHeart Study. Explaining the process to AppleInsider, Cardiogram cofounder Brandon Ballinger said about 200 participants with diagnosed paroxysmal atrial fibrillation took part in the study. These patients were provided a mobile electrocardiogram and tasked with taking one reading per day, or when they felt an onset of symptoms ranging from lightheadedness to heart pains. Cardiogram staff used the gathered information to train the DNN, which was subsequently paired with Apple Watch heart rate data to identify AF. The DNN was recently validated against a test sample of 51 patients scheduled to undergo treatment. Each person wore an Apple Watch for 20 minutes before and after cardioversion, a procedure that restores normal heart rhythms to patients with arrhythmias. When compared against a 12-lead electrocardiogram reference, the resulting Apple Watch and DNN solution was found capable of identifying AF with an accuracy of 97 percent, sensitivity of 98 percent and specificity of 90.2 percent, all high marks compared to past detection algorithms. "Our results show that common wearable trackers like smartwatches present a novel opportunity to monitor, capture and prompt medical therapy for atrial fibrillation without any active effort from patients," said the report's senior author Gregory M. Marcus, MD, MAS Endowed Professor of Atrial Fibrillation Research and Director of Clinical Research for the Division of Cardiology at UCSF. "While mobile technology screening won't replace more conventional monitoring methods, it has the potential to successfully screen those at an increased risk and lower the number of undiagnosed cases of AF." At its heart, the project seeks to address AF through the use of common consumer devices. Currently, medical devices like Holter Monitors and wireless patches can monitor patient heart rhythms for 24 hours to 4 weeks, but these methods could take some 84 days to detect the first signs of AF. With the right software, new wearable technology like Apple Watch and other devices with accurate heart rate sensors can provide healthcare professionals with a more effective means of monitoring patients on a long-term basis. The study builds on research first published last March. At the time, Cardiogram cofounders Ballinger and Johnson Hsieh were in the process of creating a preliminary machine learning algorithm capable of detecting AF using consumer grade heart rate sensors. Ballinger and his team at Cardiogram are currently validating the DNN against a series of industry standards with plans to incorporate results into the app. Looking ahead, Cardiogram is investigating whether the DNN can be applied to other heart conditions.